Grundig GUFSAT01HD review | What Hi-Fi? Grundig, Goodmans and Bush are all part of the Alba group, and their Freesat boxes are all identical but for slightly different fascias. Here we have the Grundig version, and we were worried when we first tried hooking it up, as it struggled to find channels, despite reporting excellent signal strength. A bit of fiddling finally got it working, but we still lost the picture once or twice. However, just in time for our deadline, a software update was released that fixed all of the reliability issues. It may be that many people receive their boxes with the later firmware pre-installed, but those who buy early may have some issues. 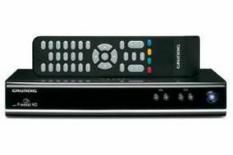 In performance terms, the Grundig box is very good, and there's almost nothing between it, the Goodmans and Bush models and the Humax Foxsat-HD. If we were pushed, we'd say that this Grundig offers the tiniest touch of extra sharpness to pictures and a smidge of added weight to sonics, but it's close enough not to be the deciding factor. What it comes down to for us is usability, and the Grundig has a menu system that's a bit more fiddly than the Humax's. Added to the awkwardness of initial set-up, it's this that's the deal-breaker.